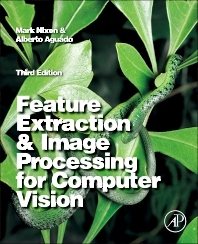 Feature Extraction and Image Processing for Computer Vision is an essential guide to the implementation of image processing and computer vision techniques, with tutorial introductions and sample code in Matlab. Algorithms are presented and fully explained to enable complete understanding of the methods and techniques demonstrated. As one reviewer noted, "The main strength of the proposed book is the exemplar code of the algorithms." Fully updated with the latest developments in feature extraction, including expanded tutorials and new techniques, this new edition contains extensive new material on Haar wavelets, Viola-Jones, bilateral filtering, SURF, PCA-SIFT, moving object detection and tracking, development of symmetry operators, LBP texture analysis, Adaboost, and a new appendix on color models. Coverage of distance measures, feature detectors, wavelets, level sets and texture tutorials has been extended.